Improving traffic safety has been a top concern for transportation agencies around the world and the focus of heavy research and development efforts sponsored by both governments and private industries. Cooperative vehicle systems—which use sensors and wireless technologies to reduce traffic accidents—can play a major role in making the world's roads safer. 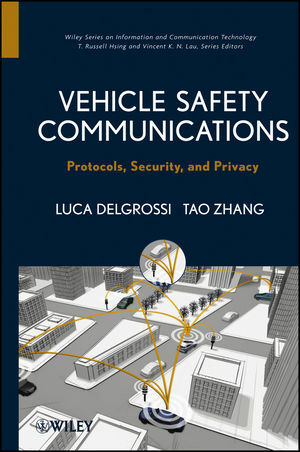 Vehicle Safety Communications: Protocols, Security, and Privacy describes fundamental issues in cooperative vehicle safety and recent advances in technologies for enabling cooperative vehicle safety. It gives an overview of traditional vehicle safety issues, the evolution of vehicle safety technologies, and the need for cooperative systems where vehicles work together to reduce the number of crashes or mitigate damage when crashes become unavoidable. Vehicle Safety Communications is ideal for anyone working in the areas of—or studying—cooperative vehicle safety and vehicle communications. LUCA DELGROSSI, PhD, is Director of Driver Assistance and Chassis Systems U.S. at Mercedes-Benz Research & Development North America, Inc., Chairman of the Board of Directors at the VII Consortium, and coeditor of the IEEE Communications Magazine Automotive Networking Series. TAO ZHANG, PhD, is Chief Scientist for Smart Connected Vehicles at Cisco Systems. He is a Fellow of the IEEE and the coauthor of IP-Based Next-Generation Wireless Networks.